While Chamba, Khajjiar and Dalhousie are the three most popular tourist destinations in the District of Chamba there are many more places, which are equally attractive. Most of these places have now become easily accessible from Chamba and merit equal attention. We have already mentioned Bharmour and Chhatrari. The later is a small town, located on the way to Lam Dal and is famous for its Shakti Temple. To know more, you may visit our page on Trek from Chamba to Lama Dal. Meanwhile, let us visit few other offbeat places around the city of Chamba, where you can go for a picnic or simply a day’s visit. Sarol is a small village located on the right bank of River Ravi at an elevation of 489 meters. The place is situated on State Highway 33 barely 8 km away from Chamba. Regular bus service connects it with the town. While the drive by the gushing Ravi River is by itself awe inspiring, the main attraction of this little hamlet is a beautiful landscaped garden, used as a picnic spot. This spot is located at a distance of 3.5 km from the main road; you will have to cover this lap on foot. Once you have rested, you may visit the sprawling horticulture farm, consisting of citrus fruit trees, located nearby. There is also a sheep breeding farm and an apiary located close to it. You may visit that also. In all, Sarol offers a scope for an exciting outing. Although the village is more famous for its Jamwal Villa Homestay you may go there for a short visit. 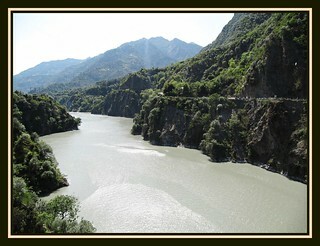 It is located at a distance of around 10 km from Chamba, right on the Ravi River. Apart from the magnificent scenic beauty the place has an outstanding rock garden that you are sure to appreciate.It is also the perfect place if you love to study Himalayan birds. Jhumar, another beautiful spot near Chamba, is located at a distance of 12 km from the city. It is situated on a top of a hill and overlooks Chamba Valley. It is famous for its apple orchards and is the ideal place for a picnic. However, if you feel a little adventurous, you may trek to Kase Wali Mata Temple, located at a distance of 4/5 km from here. The hike takes you through a deodar forest and offers a fantastic view. Many Bollywood movies have been shot at Jhumar. Among them, Taal, a musical romantic drama directed by Shubhash in 1991, is the most famous. Saho is another interesting place to visit from Chamba. This picturesque village is located at a distance of 18 km from Chamba on the right bank of River Sal, a tributary of River Ravi. It has been adopted by Tourism Department of Government of Himachal Pradesh and declared a model village. Apart from breathtaking scenic beauty, this heritage village has a beautiful stone temple built in Shikhara style. It is dedicated to Lord Shiva, known as Lord Chandrashekhar. The Shiv Linga in this temple is five feet tall and largest in the district. An idol of Nandi, made out of stone, can be seen just in front of it. An interesting feature about this idol is that if you knock at its throat, it will produce a jingling sound. Buses for this hamlet are available from Chamba main bus stand. There is also a rest house belonging to the Forest Department in Saho and therefore, if you intend to spend a night you may do so. Salooni, located at a distance of 46.7 km from Chamba is another interesting place to visit for a day’s trip. It is situated on top of a ridge that opens on its other side into Bhandal Valley. With an average elevation of 1.764 m the town offers a panoramic view of snow clad mountains around it. Such is its beauty that many Bollywood movies have been shot here. Among them we can name Vinashok – Destroyer (1998), Badhai Ho Badhai (2002) and Dor (2006). Apart from scenic beauty, the town has many places of tourist interest located nearby. For instance, if you drive for another 20 Km, you will be reaching Gamgul Wildlife Sanctuary, famous for its musk deer. To know more about this game sanctuary you may visit our page on Wildlife Sanctuaries near Chamba. Besides, 28 km from Salooni is the ancient temple of Bhalei Mata. Teluri Boating Point, located behind Chamera Dam can also be approached from here. The Katasan Temple, located 30 km from Chamba, is another quaint little place to visit. Although it is one of the important religious spots of the area, many go there simply to spend a day away from the hassle and bustle of the daily life. Indeed, the area around the temple is not only very peaceful, but also offers a unique view of the Chamba Valley. Close to this temple is the Baira Siul Hydroelectric Project, the first of its kind undertaken by NHPC. It utilizes the combined inflow of River Baira - Siul and Bhaledh for generation of power on run-of-the-river basis. All these rivers are tributary of River Ravi. The project is one of the four hydroelectric projects in the district and has a capacity of 198 MW (3 x 66).